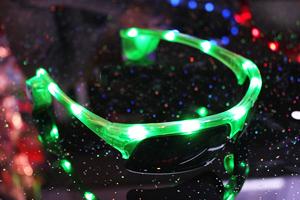 Look cool on the beach AND in the club as they glow under UV lighting! Neon Wayfarer style sunglasses. 100% UV Protection. Printed with the Twisted Beak name and logo on both arms. These sunglasses have dark lenses and are UV400 approved. Look cool on the beach AND in the club as they glow under UV lighting!�Neon Wayfarer style sunglasses. 100% UV Protection. Printed with the Twisted Beak name and logo on both arms. These sunglasses have dark lenses and are UV400 approved. Look cool on the beach AND in the club! Neon Wayfarer style sunglasses. 100% UV Protection. Printed with the Twisted Beak name and logo on both arms. These sunglasses have dark lenses and are UV400 approved. Look cool on the beach AND in the club!�Neon Wayfarer style sunglasses. 100% UV Protection. Printed with the Twisted Beak name and logo on both arms. These sunglasses have dark lenses and are UV400 approved. Batteries included ! 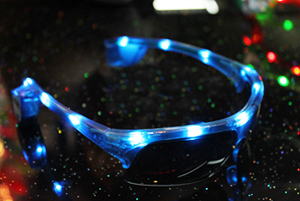 Wrap around half rim sunglasses with 11 LED's built in ! You can switch between solid colour, slow flash and fast flash.